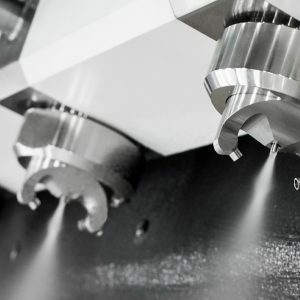 The delivery of the fluid is critical in the running of the Automated Variable System package as ineffective supply can have a detrimental effect on the spray performance. 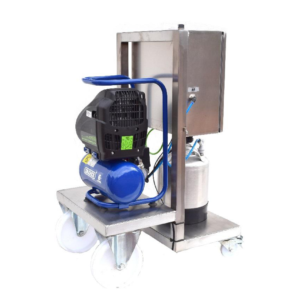 Therefore the spray system uses both a stainless steel air driven diaphragm pump and 316SS pressure vessel to ensure that optimum performance is possible. Once the system is connected and the system primed, the pump will fill the pressure vessel to a pre-determined level which is controlled by a float switch. 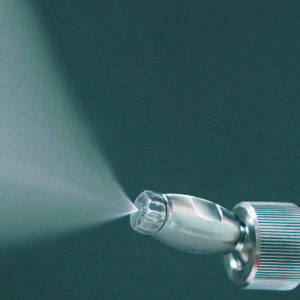 This then allows the system to take the fluid from a constant and steady level therefore eliminating any potential pulsing from the nozzles. This not only helps in the maintenance of the pump by it not having to work all the time but also guaranteeing accurate pressure control for sensitive applications. Once the system has used more fluid, then level sensor will activate and allow the pump to refill the pressure vessel. We also offer a manual change over system using two pressure vessels and no pump if required. We also offer the option of a heated system, where things such as butter or chocolate need to be heated and kept at a certain temperature in order to be sprayed properly.